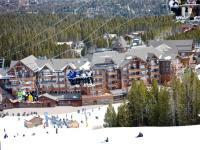 Here are the top hotels for your Breckenridge ski trip! 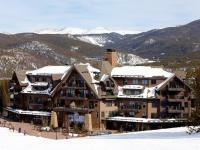 Situated at the base of Breckenridge Ski Resort's Peak 7, this upscale all-apartment lodge with ski-in/ski-out access is 2 miles from shopping and dining on South Main Street. Understated 1- to 4-bedroom apartments have balconies or patios with mountain views, living rooms with pull-out sofas and fireplaces, and kitchens with washer/dryers. There's a rustic-chic restaurant with a bar and a wood-fired pizza oven. Other amenities include a gym and a game room, plus private ski lockers and a shuttle service to town. An outdoor area has fire pits and hot tubs. 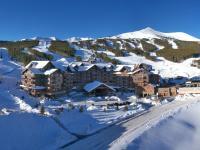 Set within Breckenridge Ski Resort, this polished ski-in/ski-out resort is a minute's walk from the BreckConnect Gondola. Rustic studios have balconies, kitchens and living/dining areas with sofabeds and fireplaces. All include flat-screen TVs and Wi-Fi access. The 1- to 4-bedroom apartments add separate living rooms. There's a casual cafe, a bar and an upscale restaurant, plus several cozy lounges, and a heated patio with an outdoor fireplace. Other amenities include a spa, a gym, indoor and outdoor pools, a hot tub and a bowling alley. Next to Maggie Pond, this mountain hotel is 2.5 miles from Breckenridge Ski Resort and 5.4 miles from Breckenridge Golf Club. Relaxed rooms with mountain views have flat-screen TVs with premium cable channels, fully equipped kitchens and free Wi-Fi, in addition to pull-out sofas and balconies. Suites add separate living areas and extra TVs. Amenities include a heated outdoor pool, hot tubs, and a garden area with BBQs and a fire pit, as well as a 24/7 fitness center, game room, and a lounge with a fireplace.